The Musical Instrument Museum in Berlin is a haven for those interested in the history of music. It houses the largest collection of musical instruments in Germany, with more than 3,500 pieces from the 1500s to today. The museum is also a part of the State Institute for Music Research under the Prussian Cultural Heritage Foundation. Part of Berlin’s Kulturforum, the museum (Musikinstrumenten-Museum Berlin) is home to some of the world’s rarest instruments from around the world. Notable pieces include Bach’s harpsichord, Benjamin Franklin’s glass harmonica, Frederick the II of Prussia’s flute collection, and rare Naumburg wind instruments from the early baroque period. You can purchase an individual entry ticket or use the Berlin Pass, which includes free entry to more than 50 attractions in the city—including the Musical Instrument Museum—as well as a public transport ticket. 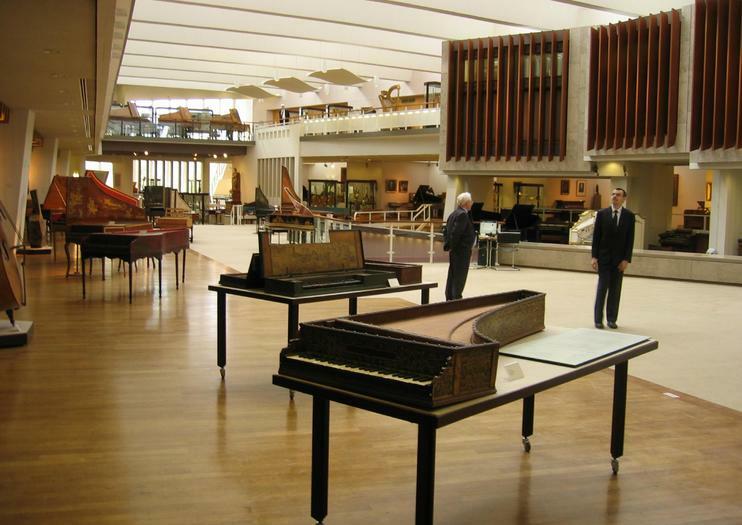 The Berlin Musical Instrument Museum is a must-visit for music aficionados. The museum offers an onsite café with changing lunch menus. Audio guides are available for rent in English and German. The entire museum, its parking facilities, and the restrooms are fully wheelchair accessible. The Musical Instrument Museum is located at Berlin’s Kulturforum at Tiergartenstrasse 1. Take the city bus M41 to the Philharmonie Sud stop, or bus 200 to the Philharmonie or Varian-Fry-Str./Potsdamer Platz stops. The museum is also a short walk from Potsdamer Platz, to which you can take the S1, 2, 5, or 25, or the U2 U-Bahn. The museum is open from 9am to 5pm Tuesday, Wednesday, and Friday; 9am to 10pm Thursday; and 10am to 5pm Saturday and Sunday. You can learn more about the instruments with a public guided tour offered on Thursday evenings and Saturday mornings for a small fee. The instruments on display are constantly rotating and offer an opportunity to see a multitude of rare pieces. The Kulturforum, a collection of cultural buildings near Berlin’s Potsdamer Platz, is a hub for the arts. The most iconic institutions are the Berlin State Library (Staatsbibliothek zu Berlin), the Philharmonic (Berliner Philharmoniker), and the Musical Instrument Museum, all designed by Hans Scharoun. Other notable buildings are the Picture Gallery (Gemäldegalerie), the Berlin Art Library (Kunstbibliothek), and the Museum of Decorative Arts (Kunstgewerbemuseum), making this complex a great place for art lovers to spend a day exploring.